2014세계 태권도한마당 대회 첫날 경기가 열린 21일 대회장인 포항실내체육관 옆으로 2명의 선수가 걸어나왔다. "아깝다. 준비를 많이 했는데 출전도 못해보고…." 이제 40줄로 접어든 듯한 그는 젊은 선수와 이런 말을 나누며, 주섬주섬 짐을 정리했다. 그는 이날 오전 손날격파선수로 출전신청을 했으나 경기시간에 맞춰 나오지 못하는 통에 실격처리되고 말았다. 그렇지만 그는 아쉽다는 말을 하면서도 얼굴은 환한 미소가 그치지 않았다. 지나온 시절을 생각한다면, 또 자신을 믿고 바라보는 제자들을 생각한다면 오늘의 자신이 너무나 자랑스럽고 대견한 덕분이다. 그는 이번 대회 파주시장애인태권도협회 코치겸 선수로 출전한 이기남(41). 그의 이력은 정말 특이하면서도 누구도 겪어보기 힘든 아픔을 두번이나 겪고도 꿋꿋하게 살아온 인간승리의 대변자다. 초등학교 4학년때 태권도를 시작하기는 했지만 그는 한때 장래가 촉망되는 축구선수였다. 파주 지산초에서 축구화를 신은 그는 차범근이 다녔던 축구명문 경신중과 경신고로 스카웃될 만큼 장래성을 인정받았고, 청소년 국가대표와 국가대표 상비군으로 선발될 만큼 인정을 받았다. 그러나 그에게 첫번째 시련이 다가왔다. 건국대 1학년시절 왼발잡이인 그의 왼쪽무릎이 축구선수로 더 이상 뛸 수 없는 큰 부상을 당해버린 것이다. 그길로 축구선수로의 꿈을 접고 특전사에 입대해 군생활을 마친 뒤 모방송사 스턴트맨으로 취업해 90년대초 한국 TV드라마의 한 페이지를 장식한 '여명의 눈동자'에도 출연했다. 그렇지만 그런 행복함도 오래가지 못했다. 스턴트맨 3년차에 접어들던 해 스턴트장면 촬영도중 사고로 배꼽위 상체 전체에 돌이킬 수 없는 화상을 입었다. 왼손을 잃고 오른손도 절반가량 손상되는 등 살아났다는 것이 오히려 기적적인 큰 사고였다. 장래가 촉망되는 축구선수로 활동할 만큼 좋은 신체조건을 갖췄던 그가 다리를 제외하고는 거의 손상을 입으면서 '차라리 죽는 게 더 나았을 것'이라는 절망의 나락을 떨어졌다. "한 2년정도 정말 어리석은 시간을 보냈지요. 차라리 죽어버리자는 심정으로 술에 빠져 살았습니다. 그런데 어느날 희망의 빛을 보았습니다." 2년 가까이 절망의 시간을 보낸 어느날 길에서 아예 온몸을 쓰지 못하는 장애인을 본 뒤 '나는 저 사람에 비하면 정말 행복한 사람이구나'라는 생각이 번쩍들었다는 것이다. 그 느낌을 받은 그는 2년간의 방황을 단숨에 털어내고 새 길을 찾기 시작했다. 그렇게 시작한 것이 2001년 파주 금촌초와 연풍초 축구부 코치였다. 4년 가까이 축구를 가르치던 그는 당시 은사였던 은풍초 감독이 은퇴하면서 자신도 축구코치 생활을 접었다. 이 시절 이씨가 가르친 제자 중에는 현재 여자 U-17 및 U-20선수로 뛰고 있어 이들의 경기를 볼 때마다 마음이 뿌듯하단다. 그리고 다시 시작한 것이 파주시가 운영하는 태권도교실 코치였다. 현재 태권도 공인1단이어서 정식코치자격을 갖춘 것은 아니지만 같은 아픔을 느끼고 살아가는 장애인들에 꿈을 심어주고 싶은 마음으로 이 길을 걸어왔다. 이번 대회에도 코치와 선수로 동시에 출전한 이유도 간단하다. "그동안 대통령표창을 비롯해 각계 각층의 표창을 수없이 받았는데 무슨 영예를 더 바라겠습니까. 이번 대회에 선수로 출전한 것도 저의 영예가 아니라 제가 가르친 제자들에 용기를 심어주기 위해 나왔는 데 출전도 못했으니 조금 아쉽습니다." 그러나 그는 이번 대회를 위해 사실은 준비를 많이 했다. 손날격파부문에 출전신청을 한 그는 지난 1년 가까이 매주 쉬지 않고 격파훈련을 해왔다. 다른 대회와 달리 장애인부문이 따로 없기 때문에 일반인들과의 경쟁에서 제자들에게 부끄럽지 않은 모습을 보여주기 위해서였다. "기와 10장 정도는 쉽게 격파할 수 있는데 아예 보여주지도 못했으니 그게 아쉬울 따름입니다"라고 말하는 그의 또다른 목표는 오는 9월 열리는 장애인 국가대표선발전에 출전해 태극마크를 다는 것이다. "아직은 부족한 점이 많지만 이제 국기 태권도 발전을 위해 저의 모든 것을 바칠 것입니다"라고 말하는 그의 눈빛에는 젊은 청년보다 더 불타는 의지가 담겨 있었다. 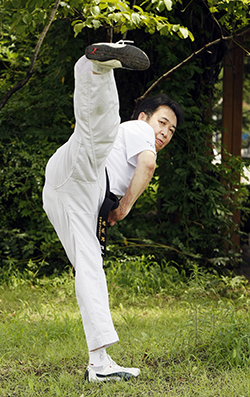 Ki-Nam Lee = Overcoming a Life-and-Death Situation and Throwing Himself in Taekwondo. Two players walked out of the Pohang Gymnasium on the first day of the World Taekwondo Hanmandang. "It is too bad. We prepared so hard yet we were disqualified..."
Likely to be in his 40's, he shared his bitter feelings with a young fellow player as he reluctantly packed his bags. He had applied to participate in the Hand Blade Power Break competition in the morning but was disqualified for tardiness. He, however, did not stop smiling as he continued to express his bitterness. It is because of his pride and his trusting students. Ki-Name Lee(41) is a coach and an athlete, representing the Paju Taekwondo Association for the Disabled. His story is one of triumph after many years of hardship. He was a promising soccer player with a solid background in Taekwondo since the 4th grade. He was acknowledged in his school, which was renowned for soccer because of its alumnus, Bum-Geun Cha. Soon, however, he met his first challenge. He injured his left knee which made it impossible for him to continue because he was a left-footed soccer player. He was forced to alter his life's path and decided to go to the military instead. After completing his military service, he went into show business and made appearances as a stunt man in remarkable television shows such as "Eyes of Dawn." His happiness did not last long. In his third year as a stunt man he severely burned his body all the way up to his navel during filming. He lost his left hand and half of his right hand, leading people to believe that it was a miracle that he was even alive. The effects of that accident lasted a long time. Having once been a promising soccer player to now being completely injured, except for his legs, he fell into a bottomless pit of despair thinking, "It would have been better if I had died." "I spent nearly 2 years with miserable thoughts. I immersed myself in alcohol because I thought I would better off dead. Then one day, I saw a beam of hope." He had seen a person who could not move his body at all. He then thought to himself, "I am much better off compared to him." He said he had started to look for a way to live his life in a new way and to stop being miserable. In 2011, he started coaching for soccer teams in the Geumchon and Yeonpoong elementary schools in Paju. After almost 4 years of coaching, he retired as a respected teacher and manager of the Eunpoong elementary school's soccer team. Lee had fostered a few great players who now play in Women's U-17 and U-20. He is very proud of them. He then decided to make a new start as a coach of a Taekwondo class in Paju. Since he only held a first-degree black belt, he was not eligible to be licensed as a legal coach. In spite of that, he passionately pursued coaching, wishing to spread hope to the disabled. "In the past, I have been given presidential commendations. Encouraging my students was the only reason for my participation as an athlete. It is disappointing that this goal was discouraged." As a matter of fact, however, he had prepared very hard in preparation for this event. He had practiced for the Hand Blade Power Break competition every week for the past year. Since there is no disparity between players, Lee's goal was to show the confident and respectable image of a player with disabilities in competition with ordinary players. "I could have easily broken 10 tiles," Lee added, mentioning his alternative goal which was to represent Korea in the elimination match for national athletes with disabilities in September. His eyes, as he shared his passion to expand the Taekwondo culture, burned with ambition.